Can you believe it's 2017?? I swear I'm still writing 2016 on all of my assignments, and then have to do that weird crossing out/writing over the six to make the date correct. University started again so I've been busier than usual. I also have been on a (somewhat successful) spending ban so a lot of my beauty favorites this month have been either inexpensive drugstore products or rediscoveries. The first rediscovery was for my Project Pan post and it's the MAC Studio Sculpt foundation. This is one of my favorite foundations because of the beautiful dewy finish it gives! It has a lot of coverage and doesn't cling to my dry patches. The shade match is a little too dark, but I've been using self-tanner so I can work with it, finish this bottle, and buy a better shade. Also I should mention that this bottle has lasted me ages; I bought it last October and used it everyday for months! The next two beauty items are both from the only makeup order I placed this month from Elf. There were a lot of online-exclusive things I've been wanting from Elf so I'm glad I broke my spending ban for this! 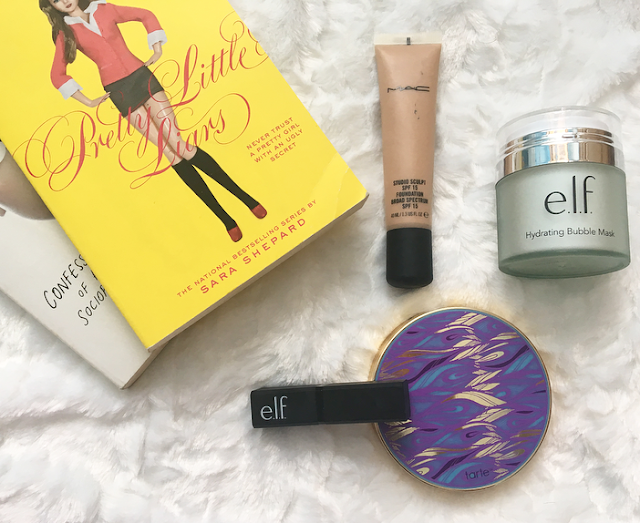 The first is the Elf Lip Exfoliator which I've been using every single day. It's not exactly a gentle exfoliator, but it's very convenient to use and it smells like vanilla. 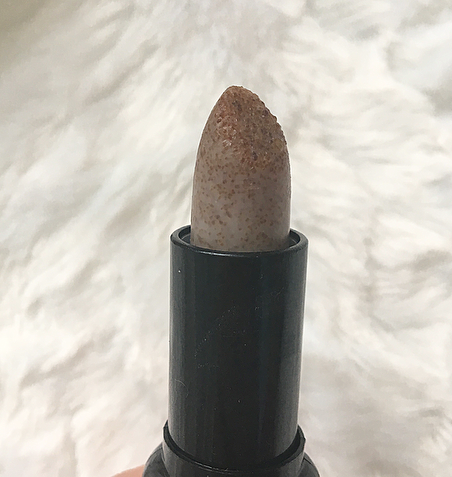 It's in the shape of a lipstick and has sugary exfoliating beads built into it. Best of all, it's only three dollars! The next Elf product I've been loving is not quite as cheap, but it's cheaper than many comparable products on the market. It's a Hydrating Bubble Mask that is so much fun to use! It applies as a clear gel but quickly starts to foam and bubble up as it's exposed to the air. I'll be doing a review of this for sure, I want to take photos of the transformation! It leaves my skin feeling nice and hydrated, so while I'd recommend it for dry or normal skin I think someone with oily skin would enjoy it, too. This is pricey for an Elf product at $14 but it's in high demand and it's more affordable than other carbonated masks I've looked into. 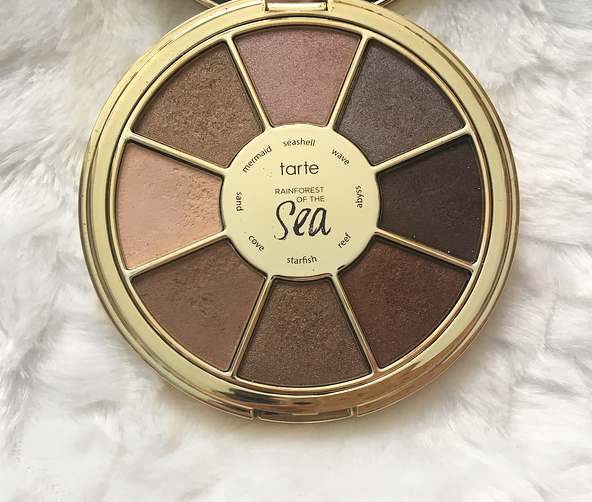 The final beauty product I've been loving this month is the Tarte Rainforest of the Sea palette. I believe this was limited edition last year but Tarte recently came out with a similar volume II with more smoky shades. I just linked the original palette which I have, which is still available at Sephora! The volume I have has beautiful purple and blue packaging and it's smaller than most palettes, which is why I've been using it while traveling. The shades are all beautiful and creamy, mostly bronzey shades that I love. As for books, I've been doing a lot of reading and rereading this month. I'm taking a Psych and Film class and my professor had us get a lot of psychology-related books that sounded interesting. The one I've enjoyed the most is called Confessions of a Sociopath by M. E. Thomas. It's exactly what it sounds like: a first-hand autobiography from a sociopath. Generally when you think of a sociopath you think of a serial killer, so this book makes you think differently about sociopaths and confirms other beliefs about them. This is definitely more of a professional read, if you aren't familiar or interested in psychology you may not like it, but it's my major so obviously I really enjoyed it! I've also been rereading the Pretty Little Liars book series, which I used to love. I still think the first eight books have an incredible storyline so I think I might only read up to the eighth and forget about all the other ones, which dragged on in my opinion! If you didn't already know from the TV show, PLL is about four girls who's old best friend Alison went missing mysteriously before the book series begins. A few years later, the girls start receiving messages from someone called "A" about secrets they had both before Alison went missing and what is going on currently in their lives. Hanna, for example, has bulimia, and Emily was in love with Alison. The girls start to think that Alison is back...but then her body turns up and it becomes a murder investigation. The ending is crazy and I highly recommend the series! A TV show that I binge-watched towards the end of winter break was a new Netflix series called the OA. This was a confusing. philosophical show that I literally can not explain in words. I guess I'd say it's about a woman who was kidnapped who claims to have some mystical powers, and she gathers a group of outcasts together to tell her story. Most of the show covers her childhood and what she experienced while she was kidnapped, and it all leads up to a big confusing cliffhanger. This is a quick series to watch but it gives a lot more questions than answers! One of my favorite shows of 2016 was Shadowhunters, and now the show is back for it's second season. This is based off the Mortal Instruments book series which I also love! It's definitely a show that is directed more for 14-16 year olds but I like it anyway, and I'll watch what I please. The second series, so far, has much better effects and acting than the first so I'm really happy with it! If you like kind of supernatural shows you should check this out. It also deviates from the books a bit more than the first season so it still can be surprising to book fans. And finally, since one of my New Year's Resolution is to donate more often, I've decided to include it in my monthly favorites posts to ensure I stick with it. This month I was very inspired by the Women's Marches that took place all over the world and I donated to the Malala Fund, which supports girls education all over the world! You can donate here. And those are all of the things I've been enjoying this month! I would love to hear your January Favorites as well! 9 comments on "January Favorites"
I've had the ELF lip exfoliator before, but I felt like it was too harsh on my lips. I'd rather just buy it from a jar. I'm reading the Mortal Instruments books series right now -- I didn't know the show renewed for another season! Also, I can relate to still writing 2016. It's so crazy to think it's already 2017, it's my graduation year! Woohoo. Great picks, Katie :) The Tarte palette looks lovely. i love the tarte palette too! the colors are great and i love the packaging ! That Tarte palette looks lovely, great post! The Elf Bubble Mask sounds nice. Unfortunately, Elf products are not available in India. I want that Tarte palette as have been loving my In Bloom one lately. Great picks! I love the Mortal Instruments series and yes, I know I'm way too old for them but hey, I love what I love. LOL! Need to watch Shadowhunter, had no idea it's based on Mortal Instruments, actually I'm not aware of the show at all.